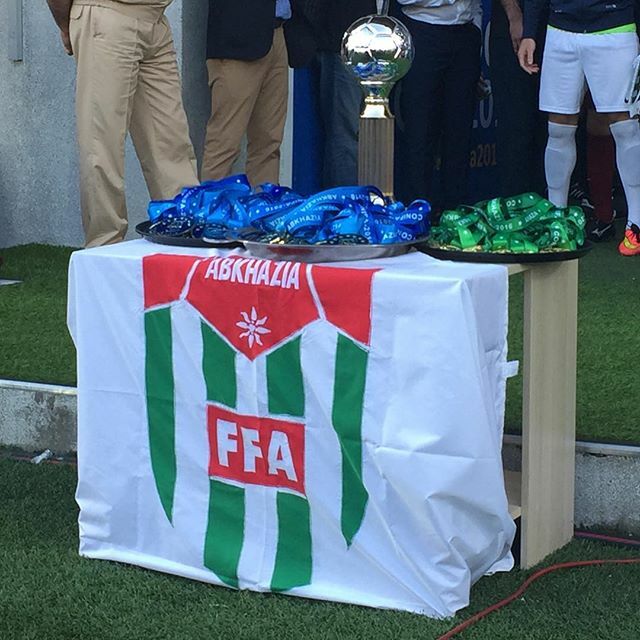 Panjab FA lose on penalties as a late Abkhazia equaliser prevents them from lifting the conIFA World Football Cup at the Dinamo Stadium in Sukhum on Sunday. The game ended 1-1, with Ruslan Shoniya cancelling out Amar Purewal’s sumptuous opener in the 89th minute. Penalties followed the full-time whistle, and Panjab surrendered a 3-1 lead to eventually lose out 6-5 on spot-kicks against the host nation. Rajpal Virk and Ash Malhotra were available again after recovering from injuries, they made the bench. Jordi Sall replaced Karum Shanker in the starting 11, the only change from the semi-finals against Padania. Thousands were in attendance to support the home side, Abkhazia seemingly produced cheers for every touch taken in the early periods. The first shot of the game fell to them, their forward had space to run into from 25 yards but dragged a low effort well wide. Abkhazia also survived the first scare of the game, five minutes in Purewal looked clean through on goal before being hacked down by what looked like the last man. Only a yellow card was dished out. The hosts should have scored in the 16th minute, though, when a one-on-one chance on the right was skied over the bar. 20 minutes later they put over another opportunity, an almost mirror image of the previous. On both occasions keeper Raajan Gill made himself a large presence in goal. Sall and captain Amarvir Sandhu provided Panjab’s best moments before the interval from long range, their efforts narrowly went over and wide respectively. Abkhazia also shot from distance, theirs were a lot wilder. Minutes before the hour mark the deadlock was broken in the Final through Panjab top scorer Purewal. The striker was threaded in sublimely by Mohammed Omar Riaz before dinking into the top corner, keeper stunned. The goal was the Darlington man’s seventh of the tournament, who was out injured for almost a year before playing this summer. It was also the first and only goal Abkhazia conceded in the World Cup. Pressure piled on Reuben Hazell’s defence as the game grew, bodies were thrown in the way by a road-block defensive unit, which only conceded three goals in five games itself. Purewal had a great chance to double the lead 12 minutes from time. Played in on the right, he had only the keeper to beat from an angle with a defender on his heels, but dragged his low shot past the left post. Gill then held onto a fierce volley from outside the area, many in the ground thought it was in. Approaching the final minutes of the 2016 World Football Cup, Shoniya buried in from 5 yards after a terrific cross – it really was, from the right, sinking Panjab hearts. As there’s no extra-time period in this competition, penalties followed. Purewal, substitute Virk and Gurjit Singh put Panjab in control, with Gill saving one of Abkhazia’s and another of theirs going wide. But Shanker and Jhai Dillon’s kicks were then saved, and the hosts scored twice to send the game to sudden death. Aaron Minhas saw his penalty saved and Abkhazia were their to capitalise, securing the trophy in their home nation, and sparking a pitch invasion. Stupendous celebrations followed, and we’d like to congratulate Abkhazia one more time on winning the 2016 CONIFA World Football Cup. Under two years ago, Panjab FA held their first trial session on a muddy, uncut, park pitch in Wednesbury, West Midlands. 20 months later, they were minutes away from becoming conIFA World champions. My oh my, have they come far.